A cracked winterizing system valve was revealed when it came time to de-winterize the 5er. 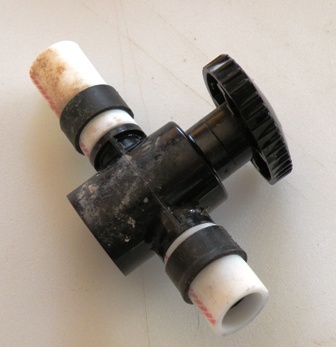 With flushing the anti-freeze out of the lines, that cracked rv water valve finally let go altogether. This time there was no problem seeing the failed winterizing system valve. Not a good thing, but sometimes it's better to have a big leak you can see... rather than a lil' one! :o) that goes unidentified for a bit. The hose barb on the right side of the valve had cracked, inside the line near its' end, making a very visible spray, this time, in the pump compartment. 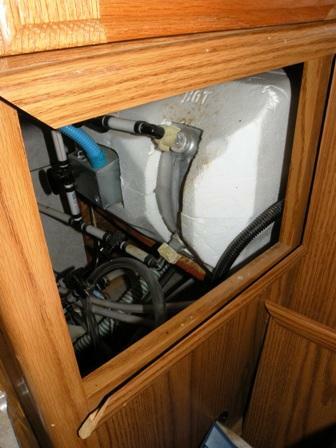 Just like the dump valve for the fresh water tank that I replaced with a brass valve a couple years ago, Jayco opted to install a rinky dink plastic winterizing system valve when they installed the valves for winterizing the water system of our fifth wheel. I don't know what I'd do if I was 6' 4" and 250 lbs! I'm not sure I could even get squeezed down in there to do the job. Wouldn't it be nice if RV Designers earned some of their pay... Doin' some thinking... about how a fella is gonna be able to repair what they built! One thing I've found to help, are some relatively new plumbing fittings, that make doing RV winterizing system valve replacement a snap... Literally! Shark Bite fittings! When you first look at 'em... and first use 'em, they seem too good to be true. But, not so! 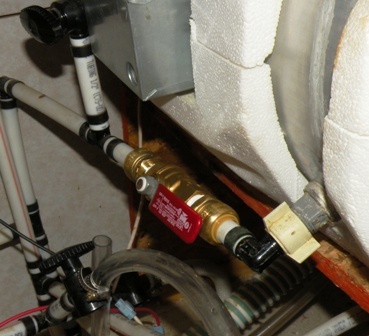 It really is that easy... and you really are done, with a solid, tight repair/RV winterizing system valve replacement. You won't need much if you use the Shark Bite fittings. There is no PVC cement, No propane torch, no soldering... little wrenching... Just cut the pipe square with the Pipe shears (about $15 or so), make sure the cut end is clean and smooth... Teflon tape the fittings and wrench 'em into the valve. Then, take that assembly (Valve with two fittings in place) and simply push the ends of the pipes into the Shark Bite fittings... and you're done! There's another, long term benefit to using the Shark Bite fittings... 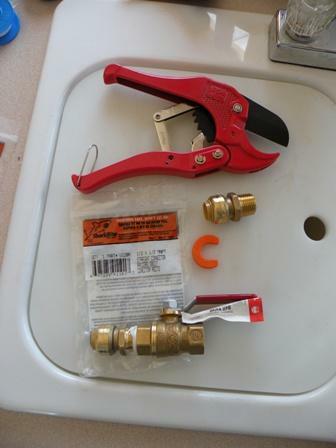 If... you have to replace THIS valve, or need to make some other changes in the future, you simply snap that small, orange, C shaped removal "tool" around the pipe, press it with very little pressure against the end of the fitting and SNAP! you take the Valve out of the line! It seems too easy... but I've used these before and they're good! Sweet! ... and you'll agree, $17 bucks for parts... $18 bucks for the tool, and maybe a 1/2 hour of your time is well worth the effort to replace your own broken winterizing system valve.